This morning I had my scheduled train journey from London, UK to Manchester, UK cancelled. It’s not that I wasn’t warned. The British press has been hysterical the last days because temperature was going to be below freezing and some snowfall was expected. For example BBC had a subject matter expert in the studio showing how to pack the trunk of your car with stuff feasible for a trip across the North Pole. Anyway, encouraged by that the train was set to go on the online status I made my way to Euston Station, where I was delighted to see the train was announced for none delayed departure on the screen there. Only to be very disappointed by the message, 10 minutes after scheduled departure, saying that the service was cancelled “due to the severe weather conditions”. Well, well, well. The temperature is above freezing this lovely Sunday morning. There is practically no wind and only some watery remains of tonight’s snowfall on the ground. With that interpretation of the raw data I guess you couldn’t go around in Scandinavia a considerable part of the year. But that is how it is when making raw data into information. Different results indeed. I guess it is good business for Virgin Train not to be prepared for a little bit of snow when operating in England thus making the first sign of the white fluffy stuff from above being “severe weather conditions”. 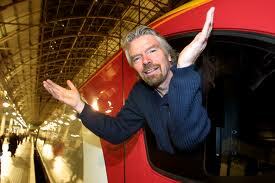 My next business analysis with Virgin Train will be targeting at the refund procedure. Hope the customer experience will be just fine.